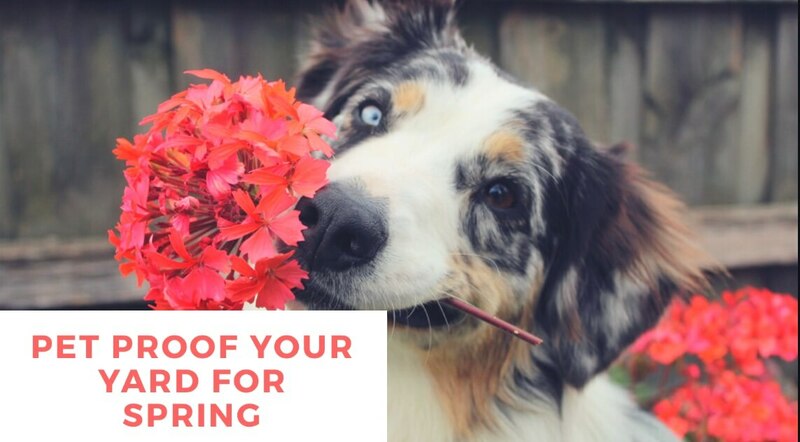 Your pets, just like you, will be experiencing spring fever this season. What can you do to protect your pet in your yard and protect your yard from your pet? Besides providing food, water and shelter for your pet, here are a few ideas to get you started. If you are bringing home a puppy for the first time, it is not a good idea to turn them loose in the backyard. As they age you can begin letting them out a few hours at a time, as they seem able. Puppies and Dogs like to dig, chew and eat many different things in the yard so It’s up to us to make sure they stay safe. You will want to make sure that your yard is free of pests. Treat your yard for fleas and ticks prior to allowing your dog outside. This won’t negate the need for topical treatment but it will go a long way in preventing flea infestations. Avoid toxic mouse poison in your backyard. It can cause internal bleeding, brain swelling and kidney failure. Each year there are nearly 40,000 calls regarding mouse poison reported by the ASPCA Animal Poison Control Center. Consider planting mint plants or using mint as a natural deterrent to mice and other rodents. Fertilizer is another area of concern for dogs. Bone meal smells a lot like the cow or fish it came from. To your pet, it is just a nice meal. Fertilizer can cause pancreatitis in dogs if it is ingested which will result in vomiting or diarrhea. Look out for allergies too. If you notice your dog having skin irritations, hair loss, licking their paws or other signs of allergy, it is a good time to visit your veterinarian in Richmond and get some relief for your pet. Not all pets like to wander but many do. You also, can’t predict when a squirrel will run through the yard and cause your pet to run too. Keeping your pet in your own yard is a kindness to your neighbors and protects your pet from many hazards as well. There are many good fences you can get, vinyl, wood and chain link all do the job well. Be sure and pick something that will work with your breed of pet and look pleasing too. If you have goats, or animals that tend to stick their necks out, be careful. If they get stuck, they will be easy prey. If you are worried your pet may dig, placing chicken wire under the fence and burying it a foot or two can prevent digging. Concrete under the fence is also a good idea. Cats also will roam. This is a problem for cats who go outside because they can get ran over. Putting a wire cap on your fence or a mesh awning inside the fence is a good way to deter your cat getting out of the yard or other cats getting in. Consider having your pet spayed or neutered to prevent overpopulation and the behavior challenges of pets that are in heat. Your veterinarian will be happy to discuss the pros and cons of spaying and neutering. Some pets are notorious for escaping so be careful and try to think like they do. You will want to consider running chicken wire around your garden or a good fence. Pets can dig and trample your plants easily destroying what you have invested time in. Place rocks in planters if your pet likes to tip things over. Put barriers around your flowerbeds or use raised beds to discourage digging. Be aware of poisonous plants in your yard. Many plants are dangerous if ingested. One final thought; if you have a doghouse, consider putting marble, granite, tile or linoleum down inside to give your dog a cool place to rest. As you can see, there are a few dangers in the yard to be aware of. Pet proofing your backyard will help prevent a few disasters. If you have any questions or need a assistance from your veterinarian in Richmond, please call Advanced Animal Care Richmond today.